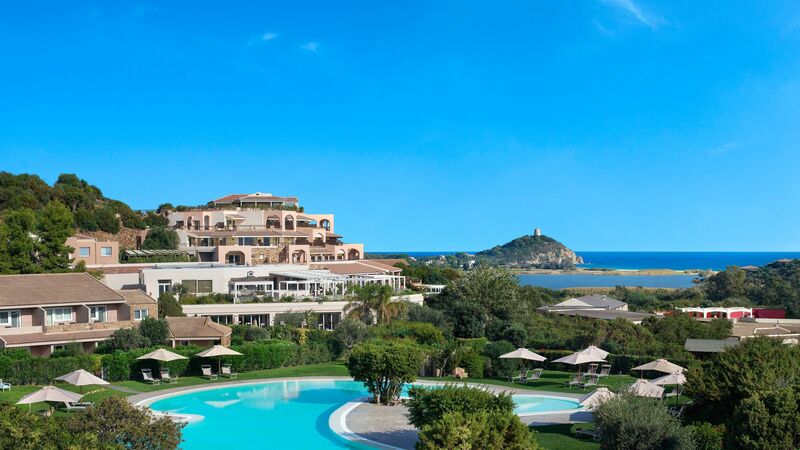 Holidays in Chia take you to the south coast of the Italian island of Sardinia, where you’ll find wild coastlines and crystal clear waters. This little village offers you a taste of the laid back Italian lifestyle, with spectacular natural landscapes for those wanting to explore. Couples will love the chance to simply relax in each other’s company on the white sands of the beach, while adventurers can walk, sail and mountain bike through sand dunes, crystal clear waters and emerald green forests. When it comes to dining, you’ll find family run restaurants and traditional eateries in the centre of the town. Little roads lead out into the surrounding vineyards, olive groves and orchards, perfect for those who enjoy fresh local produce and a taste of traditional Italy. If you want to try something more active you can enjoy surfing in the little bays around Morto and Cala Cipolla, while sailing, snorkelling and wind surfing are also available. Luxury holidays in Chia centre around its spectacular natural coastline. There are a few upmarket hotels and restaurants dotted along the coast, but the main draw of this quiet town is its serene atmosphere and the chance to immerse yourself in nature. Spend your day in the azure blue waters of the lagoon or on the white sands of Chia Beach. The beach club has loungers and parasols for guests, and serves snacks and refreshing cocktails from its chic bar. At Sovereign we’ll take care of all the details, so you can spend your time relaxing and immersing yourself in the laid back atmosphere of beautiful Chia. Holidays with us come with airport lounges and private transfers as standard, as well as including expert advice from our Trusted Advisers. Book to stay at the Chia Laguna Resort for beautiful views of Chia Beach and its lagoon, fantastic evening shows and first class amenities and activities for both adults and children. Chia Tower (Torre di Chia) balances on the headland separating two of the best beaches in Chia – Su Portu and Sa Colonia. Su Portu offers the easiest route up to the tower, unrolling a cobbled path that wends through cypress trees and birches. It fetches up at the round tower, which comes with head-turning views of the lagoon-splashed coast. Chia Tower has more than good looks going for it, too. This pirate watchtower flags up the birthplace of the 8th-century BC Phoenician city of Bithia – skeletons of the city foundations still ghost the headland. Transfer time from Cagliari airport to Chia is approximately 1 hour.